J.A.P. Engines were the products of J A Prestwich Industries in the UK named after its founder J. A . Prestwich, an engineer who formed the company in 1895. John Prestwich formed the company in his early twenties initially behind his father's house, then expanded to a new plant in Tottenham in 1911 where he became known for the creation of cinematography projectors as well as a line of internal combustion engines used in early aircraft, motorcyles and stationary engines for plant and machinery. The company produced 240,000 industrial petrol engines during WW2, and in 1945 production was taken over by Villiers Ltd and the company completely absorbed into the Villiers Engineering Company in 1964. Early aircraft were light and basic, and required a reliable and lightweight engine to power them. 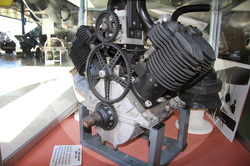 JAP motorcycle engines were often used in this application. A J.A.P. engine was used in AV Roe's 1909 triplane, regarded as the first all-British aircraft, and for a while Prestwich and Roe had a partnership. J A Prestwich would deliver the same engine to the aircraft manufacturer, allowing them to make local modifications - mainly larger venturi tubes for the carburettor, to allow for greater air intake at altitude. Our J.A.P. engine is understood to be built in 1910, is of 35 HP, four cylinder, V air cooled configuration, and was used to power one of the early Australian made aircraft, built by Lawrence Marshall in 1911, and flown in 1912.